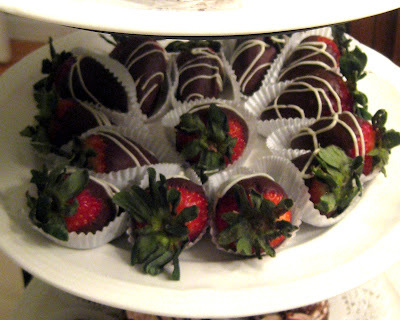 My love affair with chocolate-covered strawberries goes way back. Waaaaay back. I love them. So, I had to include them in my chocolate dessert menu. 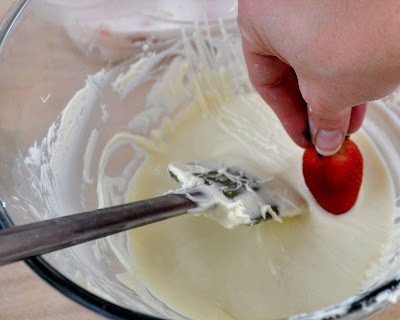 However, to get good chocolate-covered strawberries, you have to "temper" your chocolate. Huh? What does tempering chocolate mean, and why do you care or want to do it?? Well, you know how when you eat a cake pop or a chocolate-covered strawberry, it has kind of a 'crack' when you bite into the chocolate? That's because the chocolate is "tempered." If it's not tempered, it doesn't have that 'crack.' And it gets all mushy (unless it's cold). So, if you plan to use real chocolate, and not almond bark or candy melts for any kind of chocolate-dipped treat, you need to temper it. To be honest, I would probably prefer, for most treats, to just use the almond bark. Easier. Way easier. But my husband does not like the chocolate-flavored almond bark. Dark chocolate, milk chocolate. Nope. And, let's face it good chocolate is good. So, occasionally, like for the birthday party for my friend's mom, I go ahead and temper the chocolate. *An instant-read thermometer is different from a candy thermometer. 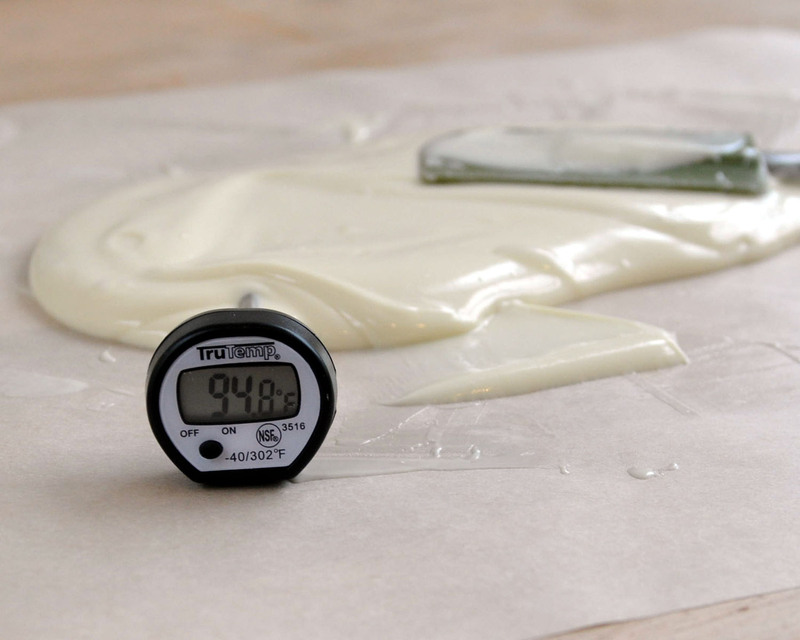 You want something digital here so that you can get the precise temperatures. I bought mine for all of $10 at Target. Start with good chocolate. It doesn't matter if it's white chocolate, milk chocolate or dark chocolate. But do pay attention as the temperatures needed for each vary. If it's not already in pieces, chop the chocolate fine. 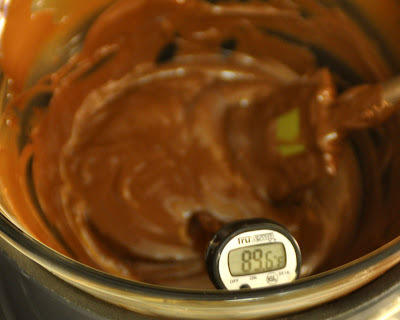 Melt about one-half of your chocolate in the top of a double boiler or in a bowl sitting over simmering water. 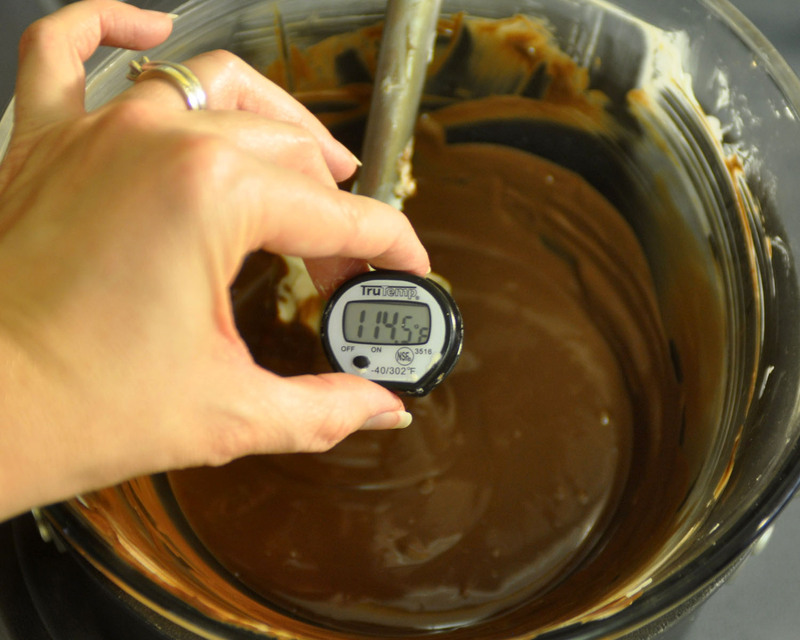 Bring this chocolate to 110 degrees for milk or white chocolate, or to 115 degrees for dark chocolate. When it gets to 110-115 degrees, take the bowl off of the boiling pan, and wipe the bottom of it with a towel. 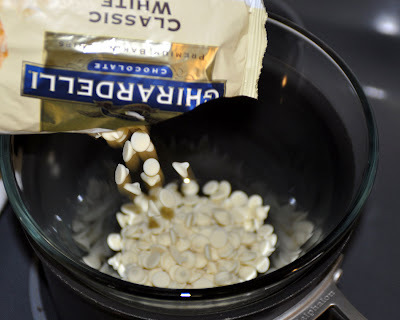 If water drips into the chocolate as you're working with it, it will seize. Add the remaining chocolate and stir until they're all melted in. This should drop the temperature of the chocolate a little. You now want to drop the chocolate's temperature even more. You can do it in the bowl, by setting it on some ice water while continuously stirring, but I found that led to some spotty temperature changes. 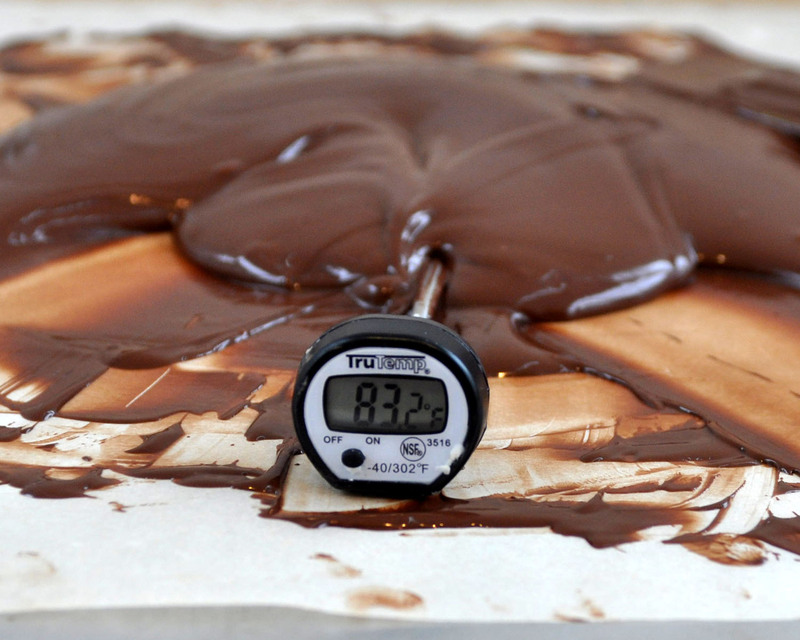 I poured the chocolate out onto a piece of parchment paper on the countertop. 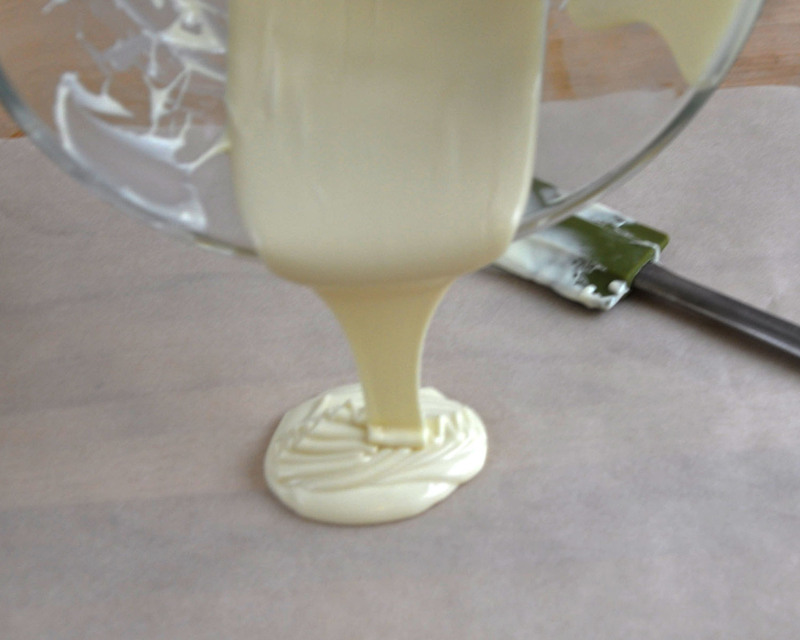 If you have marble countertops, apparently you can just use those. I don't. Then, I spread the chocolate around until it started to get a little less liquid. You want it to be 84 degrees or lower. 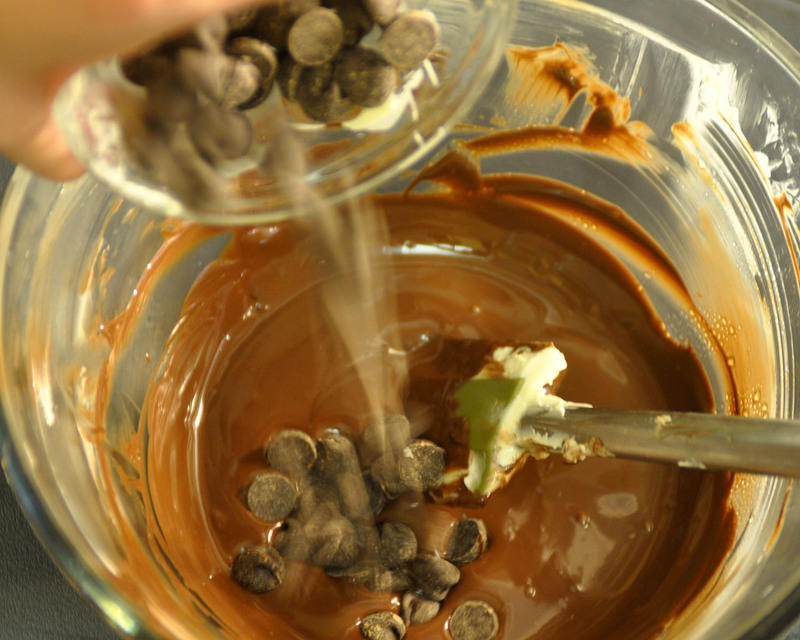 The chocolate is now technically tempered, but it's too thick to dip in. Once it's 87-90 degrees, you can dip away, and enjoy!